Welcome to the Vacation Condominiums at Tops'l the Summit! 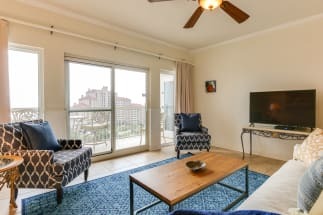 Here at Emerald Coast by Owner, we are proud to be your premier vacation rental service for this complex, and we offer you some of the most luxurious condominiums on the market! While at the complex, you can enjoy our tennis courts, the beautiful views, the outdoor pool, indoor pool, or the hot tub and spa! Looking for a workout This complex also offers a gym! If you want a good time with drinks and good food, the complex also offers you a restaurant and bar. Even though you've got everything you need in Tops'l the Summit, if you do leave the property the possibilities are endless. We recommend you check out the Destin Commons, an outdoor mall with over 90 stores and a few traditional restaurants so you can shop for whatever you desire! Activity wise, some common things to do include parasailing, deep sea fishing, paddle boarding, jet ski rentals and so much more. Don't miss out on the trip of a lifetime, you won't regret a stay at Tops'l the Summit! Book your next vacation to the beautiful Sandestin Area at the Tops'l The Summit. Be sure to click on the 'Email Owner' button found on each listing to send the property owner a message directly. Booking direct with the owner allows you to get answers to your questions before you book and assures you are getting the best price for your rental!